Karen described the event more completely (http://thenimbleneedle.blogspot.com/2013/07/apple-needlepointers-comes-to-visit-and.html). 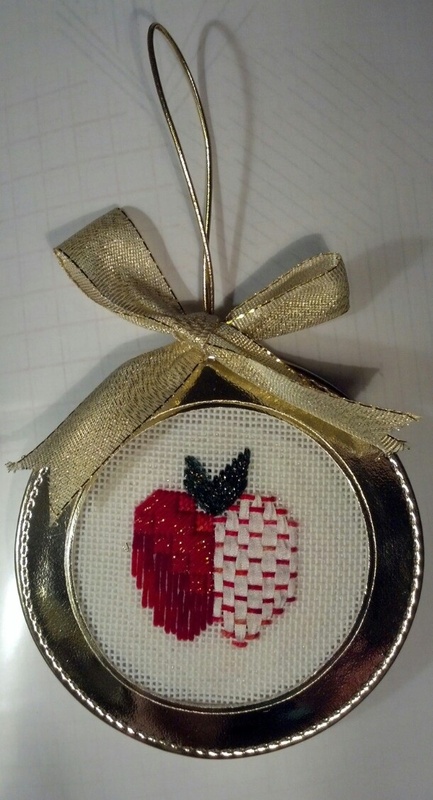 But, a few weeks ago, the Apple Needlepointers (ANG Chapter central PA) came to visit. It was a great day & met many new folks. I suggested for their 2013 Retail Therapy Excursion that I would design a small project as a 45 minute mini work shop allowing the members to try out some new threads. And, Karen chose the threads including shaded Very Velvet, Brown Paper Packages Stardust, Petite and Regular Frosty Rays, River Silk ribbon and Painters Thread Perle 5. The idea was to try out new threads – no two apples had to be alike and it was a great way to learn what threads can and can’t do. It was a huge hit and the design may become their chapters name badge. Just yesterday, it was presented to the rest of the chapter members not present at the Saturday event. They loved the apple and thought it was great that I designed it especially for them! I am thrilled that they enjoyed the day so much and that they liked the design enough to consider it for their name badge! I finally got around to finishing my Kumihimo bracelet. I needed help with attaching the clasp on each end. 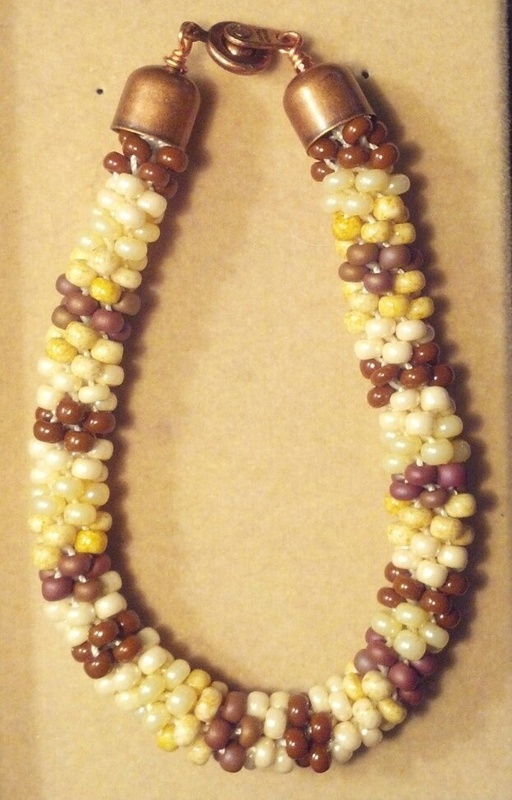 Thanks to the ladies at The Bead Garden in Havertown, PA – they have everything! I figured out how to create the pattern all by myself. Generally, I do prefer symmetry over randomness. That does take more time but I like the effect. Of course, sometimes you’ve got to be wild and crazy!